Cloud computing gives end-users a utility model for the consumption of IT, such as self-service selection, service desk functions, strong SLAs and pay-as-you-go pricing. However IT shops are having to organise themselves differently to separate these services from the underlying technology. 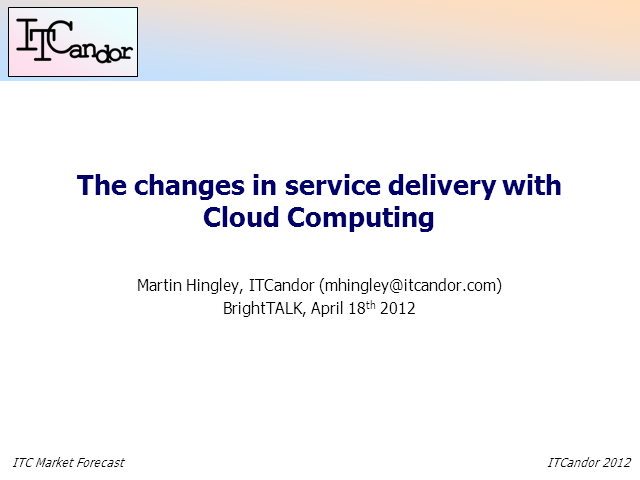 In this presentation Martin will look at a number of cloud reference architectures, outline new IT roles and how their activities should result in successful delivery of cloud services to users. He will look at enterprise, government and service provider developments as well as SaaS, BPaaS, IaaS and PaaS services.